The Nuc is made out of 60 psi high density polystyrene that I got from Polar Supply Inc. in Anchorage Alaska.Insulfoam Manufacturing Facility manufactures this at its factory in Anchorage and I have bought seconds from their factory in the past but I was not satisfied with the consistency of the seconds. Here is the description of their 60 psi product. To build the Nucs I wanted straight and true boards so I could maintain proper bee space so I bought firsts from Polar Supply Inc. The screens on the bottom board are 1/8 inch hardware cloth I bought atAlaska Industrial Hardware (AIH), the screens were pressure fitted and then hot glued in place. The hand holds was cut by stacking a few circular blades. As you can see in the photo above the hand hold does not need to be very thick, just wide enough for your fingers to get into it. I left just enough room below the hand hold to allow the placement of the plastic disk entrance guard so the guard did not interfere with the bottom board or the hand hold. I bought the plastic disk entrance guards from BetterBee , The hardware for the entrance guard was bought atAIH. When cutting the round entrance cut at an angle up so rain and moisture is directed to the outside, a slight angle is all that is needed. 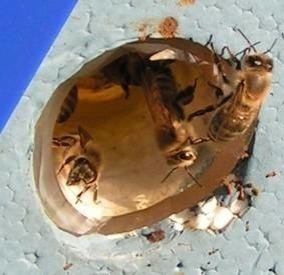 I lined the entrance with a soft plastic tubing to keep the bees from chewing at the inside of the entrance hole and the bees could also keep this cleaner. You can leave the entrance unprotected if you wish or use other material such as PVC plastic if you wish, this is a little thing compared to maintaining bee space. I built this nuc to fit on top of a Polystyrene Nuc Boxes I bought from BetterBee, but you can build this to any dimensions you wish. 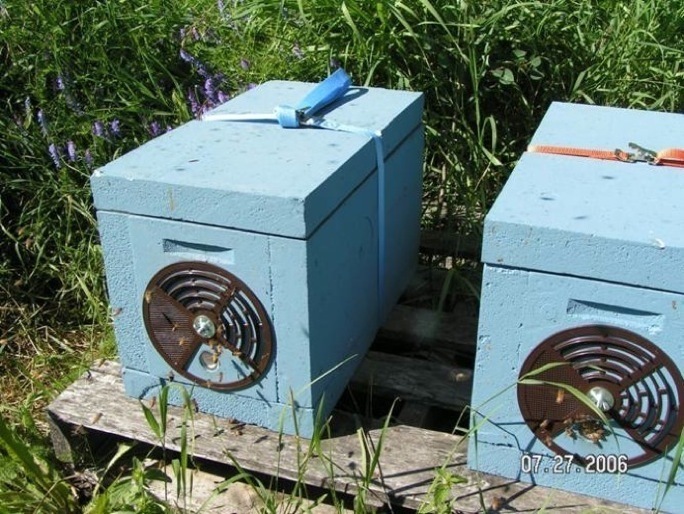 These are as tall as any regular deep wood hive box, and rabbits are set in for maintaining top bee space on the boxes. The rabbit rests are made from ripped fir or pine. The nuc was glued together usingElmer’s Ultimate Polyurethane Glue and sheetrock screws about 4 inches long I bought at AIH. 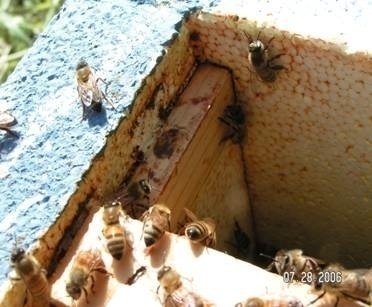 I like top bee space so a flat inner cover can be used. The inner cover was made from a flat piece of acrylic sheeting bought atLowe’s, I gave them the dimensions I needed to a clerk and they cut it out for me free of charge. I think each inner cover cost about $3.70. As can be seen in the picture above I use a Spring Buckle Strap made of lightweight polypropylene to keep all the hive components together for transporting and to keep the wind from blowing the top off, I had them custom made from Strapworks.com. I made extra tops and bottoms for just in case needed and if needed a bottom board can be put on top for extra ventilation for transporting. The rabbit is inset 5/8 inch from the top and the rest is 3/8 inch, inside measures 8 inches by 18 1/4 inches, that would make the outside measurements 12 x 22 1/4 inches. 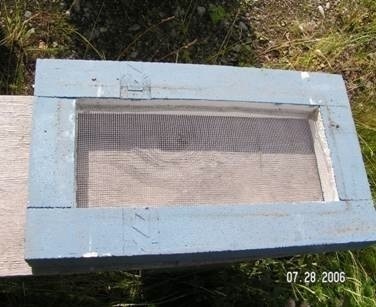 The top is 12 by 22 1/4 inches and the box is as deep as a regular deep wood Hive box. See more pictures below. Built to stack on top of a Styrofoam nuc bought from BetterBee. 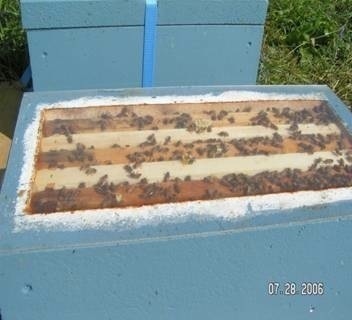 Used this way with screened bottom in between the two nucs you can start a two queen hive. I did this while splitting a three pound package putting 1.5 pounds of bees and a queen in each nuc. Rabbit glued in and set 5/8 inch down from the top to give top bee space. Acrylic inner cover so the colony can be viewed without exposing colony to the weather. This really comes in handy in late winter when checking to see colony strength or whether they are dead or not to make counts in case package bees are needed for deadouts. 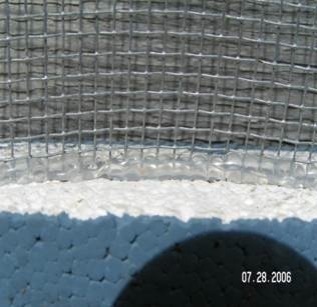 Screened Bottom for added ventilation and moisture drainage. 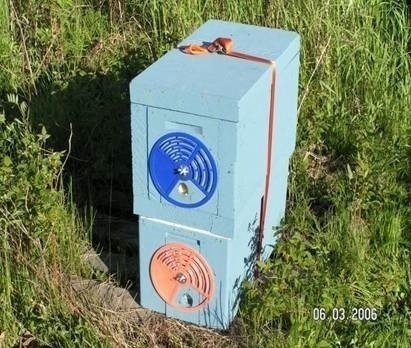 I find that ventilation is very important in Alaska where I am in South-Central Alaska. Screen is 1/8th inch hardware cloth, it is pressure fitted and hot glued in place. Screen for bottom board hot glued in place.